Farofa is a delicious accompaniment to many Brazilian dishes, especially the classic black bean stew feijoada. Farofa is made with manioc (cassava) flour (harina de mandioca), which is toasted in a skillet with butter, onions, and palm oil. The root of the manioc (cassava) plant is commonly sold as a very fine starch (almidón), often called tapioca flour in the US. 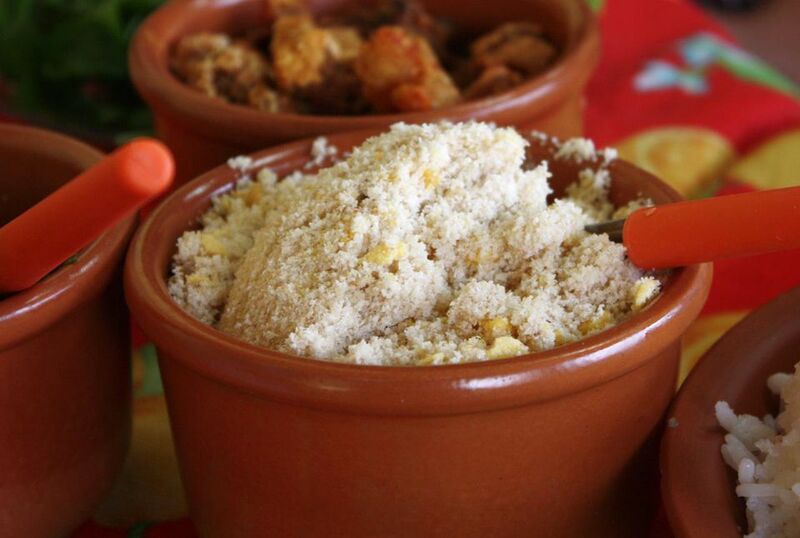 To make farofa, you need manioc flour that is coarsely ground, with a texture like farina cereal. You can find manioc flour in Brazilian markets or online. If you can't find manioc crumbs, you can substitute with bread crumbs - the flavor is not the same but it is still tasty. Melt the butter and palm oil in a skillet over medium-low heat. Add the onions and cook until very soft and golden, about 10 minutes. Stir in the manioc flour and cook, stirring, for 3 to 4 more minutes until well mixed and evenly toasted and lightly browned. Stir in optional black olives and/or hard boiled eggs if desired.